This is a game that evolved from a little post box game. The boys love posting things into our shoe-box post box and this has developed into 'writing' letters to post. With Ollie's current love of forming real words the next step in the game has been to draw a picture of a cat or a dog and write the word next to it. He says that the animal is lost and he is posting a letter to the owner to tell them. 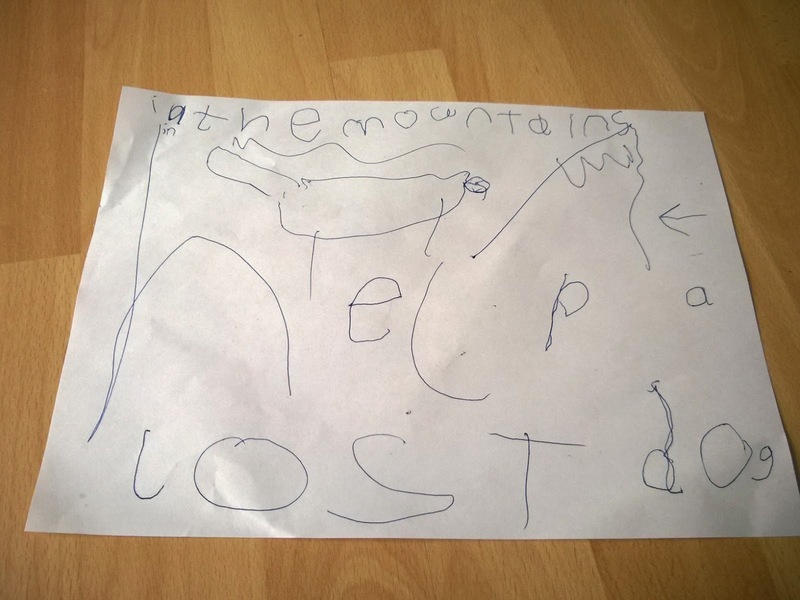 Yesterday the game took another step and became a letter to a mountain rescue team to find a lost dog. Ollie wrote the words he can do by himself (help a lost dog) and then asked me to spell out 'the mountains' for him - I asked if he wanted to write the shorter word 'hills' but he was very insistent it had to be 'mountains'. He drew his dog and the mountain and helpfully included an arrow showing where the dog was. He then hid his toy dog on the back of the sofa (the mountain) and delivered the letter to me (the mountain rescue team). Toby also delivered his letter to me (he's been trying out drawing lines with pens in both hands at the same time) and helped me rescue the dog. Unfortunately at some point a wizard turned me into a bear, so I spend a lot of time huffing around on all fours trying to catch the boys and (gently) roughhousing, while Ollie grabbed books off the bookcase to try to find a spell to change me back. So this is all a lot of fun, but it also has a lot of educational outcomes. 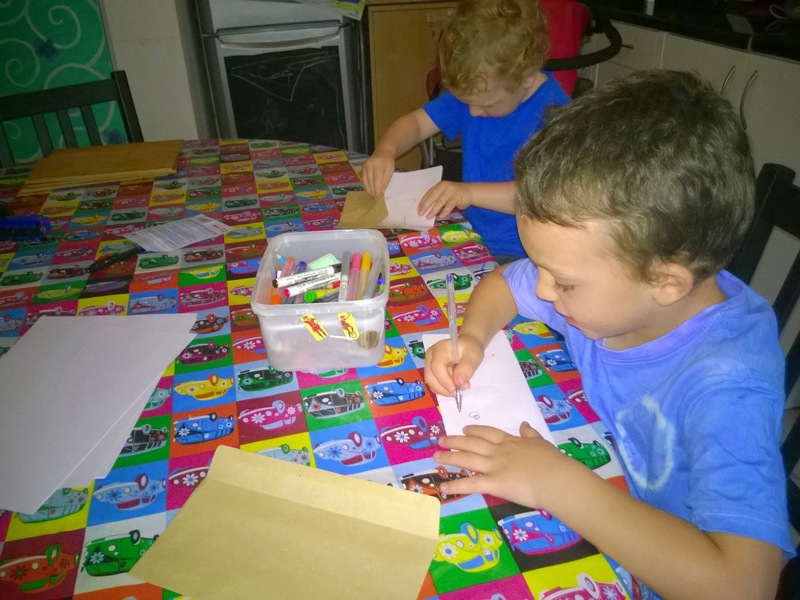 The physical benefits are to fine motor control in handling pens and manipulating folded paper into the envelope (quite tricky for little hands). It is useful for developing literacy and can be easily tailored to the child's level of development - from simple mark making, to drawings, to first words such as writing their name on their drawing and then starting to form other simple words such as 'cat'. There's a place for copying letters and words in exercise books, but to really engage children in writing and reading they need to see a useful purpose to it, such as labeling their pictures or making up postcards. This type of game is also a great way to explore narrative in play - the children are making up their own stories as you play together and combining physical objects in their environment with their own imagination. Encouraging children to describe what they're doing and give you instructions is a useful way to develop their vocabulary too. But best of all their grown up is spending uninterrupted time paying attention to them and being led by their wishes. Even the chase and catch element have a benefit because boys especially tend to want to play in quite a physical way and playing with them in this way helps them to learn how to play physically without hurting anyone else or themselves. I try to build unstructured play time into our days, where I supply a few props perhaps but then let the boys lead the play. I think this is really important for bringing up self motivated, self sufficient kids. If every minute of the day is scheduled into taught classes and adult led activities then when does the child learn to find out things for themselves? I firmly believe in the adage 'only boring people get bored' and that helping children develop (and hold on to) their natural instinct for imaginative and creative play prevents them becoming boring people.